– htmlspecialchars() and html_entity_decode() functions added for the $selection value. Thus, echo format_to_edit() function was changed to wp_htmledit_pre() function here. $url and $title values are escaped with esc_url() and esc_html() functions now there. * Disable the connectivity check when the API key is hard-coded for WPMU. I not show akismet.php source code changes here as it is the plugin but not core WP code territory. This code explicitly shows us about what kind of vulnerability in the uploaded file names was written in the short official WP 2.8.6 Security Update Release description. It is specially built file names with multiple extensions, e.g. image.jpg.php I think. Thus that vulnerability allowed to updload malicious php script on attacked site and execute it then. functions.php – 1st, function wp_check_filetype() was changed at line 2228. List of allowed mime types and file extensions definition code was moved into separate function get_allowed_mime_types(), which is used in the sanitize_file_name() function from formatting.php mentioned above. swfupload.speed.js – There is no changes in the code found, differense exists just in the text formatting. 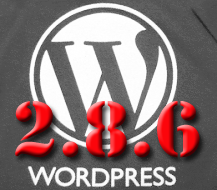 version.php – $wp_version variable value was changed from 2.8.5 to 2.8.6 only. Finally, this update says all of us, php web developers, again that we need to put more attention for build more secure code. If we process any user input we MUST to make such content as secure as possible before store it in the web site database or file system. This entry was posted on Saturday, November 14th, 2009 at 07:48	and is filed under PHP, Security, WordPress. You can follow any responses to this entry through the RSS 2.0 feed. You can skip to the end and leave a response. Pinging is currently not allowed.